Drugs and vitamins can interact with each other, and certain foods can interact with vitamins. Talk to a pharmacist or doctor if you have any concerns over food or drug interactions, or if you are taking a new drug or food supplement, even if it is a common, over-the-counter one. Carefully read any instructions with the medicine. Cholestyramine (Questran), used to treat high cholesterol, and Xenical (orlistat), used in obesity, can decrease the absorption of the fat-soluble vitamins (A, D, E and K). Combining vitamin A with retinoid drugs (used for skin conditions), which are derived from vitamin A, can increase side effects. The combination of vitamin A and tetracycline antibiotics can cause high pressure in the brain. B vitamins can reduce the absorption of tetracycline antibiotics, so making them less effective. Certain drugs may increase requirements for thiamine, including digoxin (used in heart disease), diuretics (used to treat high blood pressure), and phenytoin (an antiepileptic). Certain drugs may increase requirements for riboflavin, including anti-cholinergic drugs (used in a range of diseases, including asthma, depression, and motion sickness), tricyclic antidepressants, phenothiazines (used in schizophrenia), doxorubicin and methotrexate (used in cancer), phenytoin (used in epilepsy), probenecid (a gout treatment), and thiazide diuretics (used to treat high blood pressure). Riboflavin may stop doxorubicin from working. The combination of niacin with statins (cholesterol lowering drugs) can cause the breakdown of muscle. Niacin can increase the effects of antihypertensive drugs, used to reduce blood pressure, and so may cause a drop in blood pressure and fainting when standing up. Niacin may bind to colestipol and cholestyramine, used in gout, and should be dosed about 4-6 hours apart. Alcohol or hot drinks may increase the risk of flushing and itching, two side effects of niacin. Certain drugs may increase requirements for vitamin B6, including cycloserine and isoniazid (used in tuberculosis), hydralazine (an antihypertensive), penicillamine (an arthritis treatment), monoamine oxidase inhibitors (antidepressants), erythropoietin (an anaemia treatment) and theophylline (used in asthma). Vitamin B6 can increase the effectiveness of tricyclic antidepressants, potentially increasing side effects. Vitamin B6 can reduce the side effects of some cancer drugs, including fluorouracil and doxorubicin. Vitamin B6 reduces the effects of levodopa (used in Parkinson's disease) and phenytoin, an anticonvulsant. Certain drugs may increase requirements for biotin, including antibiotics and anticonvulsants. Folic acid can increase the effects of capecitabine (Xeloda) and fluorouracil, cancer drugs, potentially making side effects worse. Certain drugs may increase requirements for vitamin B12, including alcohol, aspirin, antibiotics, colchicines (used to treat gout), proton pump inhibitors and H2 antagonists (used to reduce stomach acid in indigestion and ulcers), metformin (used in diabetes), neomycin (an antibiotic), nicotine, nitrous oxide (an anaesthetic), certain anticonvulsants, potassium supplements and drugs used to treat HIV infection. Aspirin can increase the rate that the body gets rid of vitamin C. High doses of vitamin C can increase the levels of aspirin or non-steroidal anti-inflammatory drugs in the blood, potentially leading to side effects. The combination of aspirin and vitamin C can irritate the stomach, potentially leading to ulcers. Vitamin C can increase the amount of aluminium absorbed from aluminium-containing antacids, potentially causing side effects. Certain drugs may increase requirements for vitamin C, including barbiturates (used in anxiety and epilepsy), tetracycline antibiotics, estrogens (in contraceptives and hormone replacement therapy), nicotine, alcohol, analgesics, anticoagulants and antidepressants. Certain drugs may increase levels or activity of vitamin D, including isoniazid, used in tuberculosis, and thiazide diuretics, used in high blood pressure. This may lead to high levels of calcium in the blood. Certain drugs may increase requirements for vitamin D, including antacids (for indigestion), calcium channel blockers (used in high blood pressure), and anticonvulsants. Vitamin D is sometimes taken to increase the absorption of calcium – however, this may increase the side effects of digoxin, used in irregular heart rhythms. Vitamin E can reduce the absorption, and so the effect, of certain drugs, including tricyclic antidepressants, phenothiazines (used in schizophrenia), and beta-blockers (used in high blood pressure). Vitamin E may reduce the side effects of AZT, used in HIV infection. 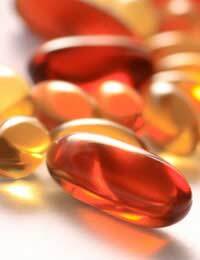 Vitamin E may increase the blood-thinning effects of the anticoagulant warfarin. Statins may reduce the antioxidant activity of vitamin E.
Vitamin K is involved in blood clotting, and may stop anticoagulants from working properly. People taking anticoagulants should avoid foods rich in vitamin K, such as green leafy vegetables, including spinach, Swiss chard, cabbage, kale, cauliflower, broccoli, and Brussels sprouts, and avoid vitamin K-containing supplements. Certain drugs can reduce the absorption of vitamin K, including aluminium hydroxide antacids. Please ask your GP about this. When you collect your next prescription, check the information that comes with it. There should be a list of anything that you should avoid, or that may react with your medicines.